You can hack on it in GitHub. It’s downloadable as a Snap (automatically updated from the git branch). For some reason the “Connect” button crashes when running as a Snap, it runs fine if you build locally. It also appears it might not be working on first run, perhaps due the command line tool prompting the user on first run. I initially tried to use the grpc interface, but ended up wrapping the command line. If anyone has some nice artistic skill please provide a nice icon for it! It also appears it might not be working on first run, perhaps due the command line tool prompting the user on first run. That shouldn’t happen, we check if we’re in an interactive session and only prompt then. Are you sure that’s the reason? Please file a bug if you find that’s the case. You can reset the prompt by deleting /var/snap/multipass/common/data/multipassd/multipassd-send-metrics.yaml). It’s speculation and we hoped you were doing that The issue occurred when @kenvandine ran it for the first time, will investigate further. Also we don’t ask on first launch, but rather on one of the subsequent ones. Is this going to be abadoned now? I saw that you archived the trello card. I would be sad to see a future native GTK GUI go away. 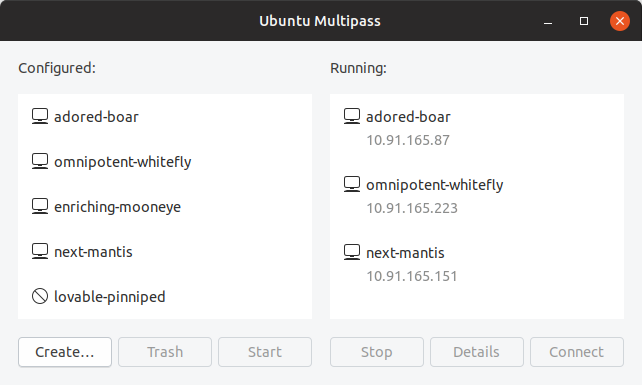 Hey @jyaku, we’re building a systray icon into the Multipass project itself now, and will be including a full GUI later on. You should set the license for the snap on the snap store, I think people will find it useful. By the way, anybody knows why the snap of multipass on the snap store is proprietary when multipass itself is GPL? You’re right, we’ll fix that. The macOS and Windows backend are proprietary, so that’s a leftover from that. Thanks!